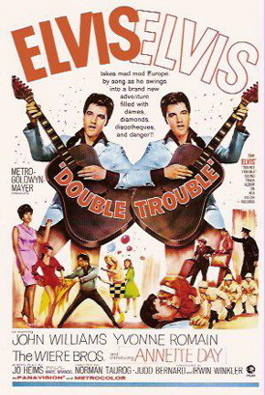 When Double Trouble came to town in the spring of 1967, I planned to use the same economical viewing strategy I’d employed throughout my teen years whenever a new Elvis Presley film was released. After buying a ticket, I entered the theater for the day’s first screening. My intent was then to sit through the accompanying second feature just so that I could watch the Elvis movie a second time on my $1 ticket. However, after watching Double Trouble the first time, I didn’t stick around to see it again. Despite being a devoted Elvis fan at the time, I remember being greatly disappointed with all aspects of the film. In fact, over 40 years would pass before I’d view the picture again, which I did recently before writing this review. • Who are all these people, and what do they want from Elvis? As a mystery, Double Trouble is less than satisfying. Its comedic moments play much better, however. “There’s a number of sight gags under Norman Taurog’s vivid recollection which will delight slapstick aficionados,” noted Variety. Continuing effective gags include the smugglers’ inept efforts to recover their diamonds and Elvis and Miss Day taking turns accidentally pouring liquids down each other’s backs. The Keystone Cop antics of the Antwerp police department, especially those of the three Wiere Brothers, highlight the film’s closing scenes. The humor of the final car chase sequence makes up for the humdrum resolution to the story’s mystery elements. 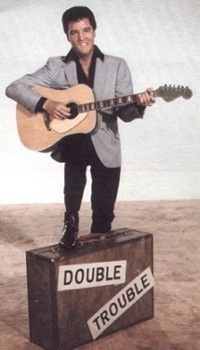 Elvis’s role as Guy Lambert in Double Trouble is a physical one. The script sports more fight scenes than the average Presley picture. They range from Elvis getting punched out with a single blow to the star using his karate moves to kill an evil assassin. Of course, Elvis’s sidekick Red West loses still another Hollywood fight to his boss. 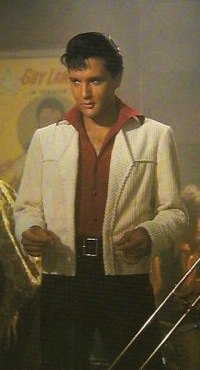 On the musical side, Elvis performs eight songs in the film. In his role as a traveling discotheque singer, five of the tunes fit well into the picture’s structure. 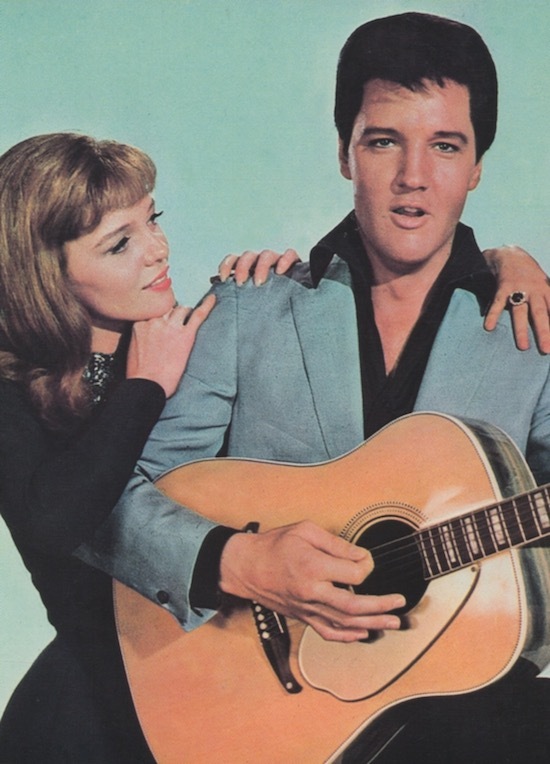 The other three, however, utilize the unsatisfactory tactic of having Elvis suddenly burst into song for no particular reason.Variety observed that some of Presley’s songs are “virtually drowned out by his backing.” The festival production number, utilizing “I Love Only One Girl,” is well done, although it splits the song in the middle, causing the number to run overly long. 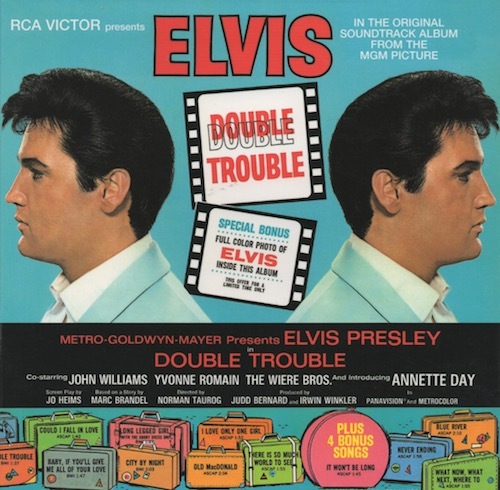 None of Elvis’s tunes in Double Trouble are as good as the number “Old MacDonald” is bad. It’s a frontrunner for the worst Elvis movie song ever. What’s puzzling about the use of this childish song is that nothing in the storyline remotely requires its use. Elvis sings it while he and Miss Day are riding on the back of a truck. 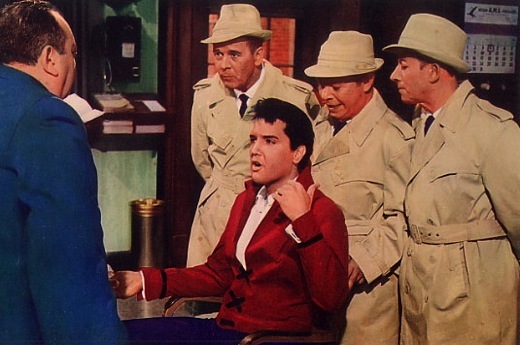 The scene could have been structured for the use of any number of more acceptable upbeat tunes more appropriate for a singer of Elvis Presley's stature. "The confusion starts with the film’s title. 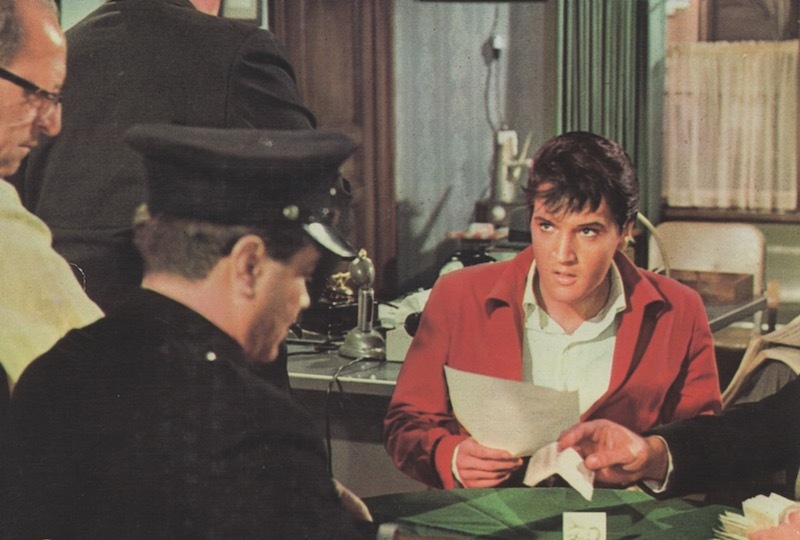 Presley’s character certainly encounters a great deal of strife, but the significance of his 'trouble' being labeled 'double' is never explained."